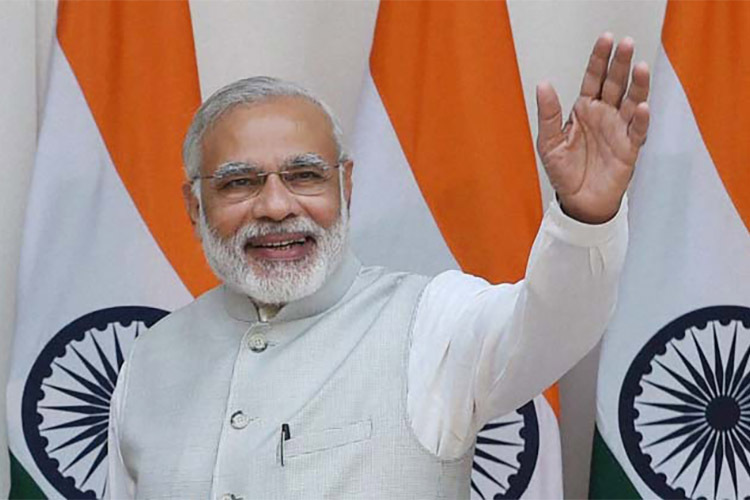 Prime Minister Narendra Modi has been the most popular figure in Indian politics for a while now and for the last couple of months, he has also been the most followed Indian on Twitter. 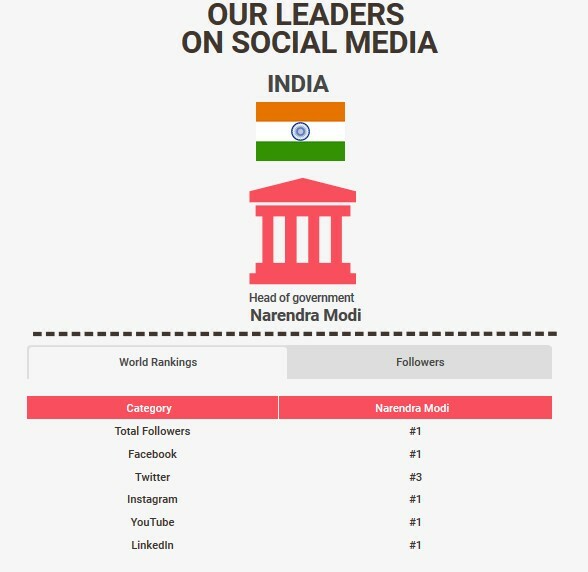 Now, according to a recent report from Cuponation, PM Modi is the most followed world leader across various social media platforms. In a recent survey, the company analyzed the social media accounts of 353 world leaders, including 144 heads of state, 142 heads of government, and 5 heads of both state and government. 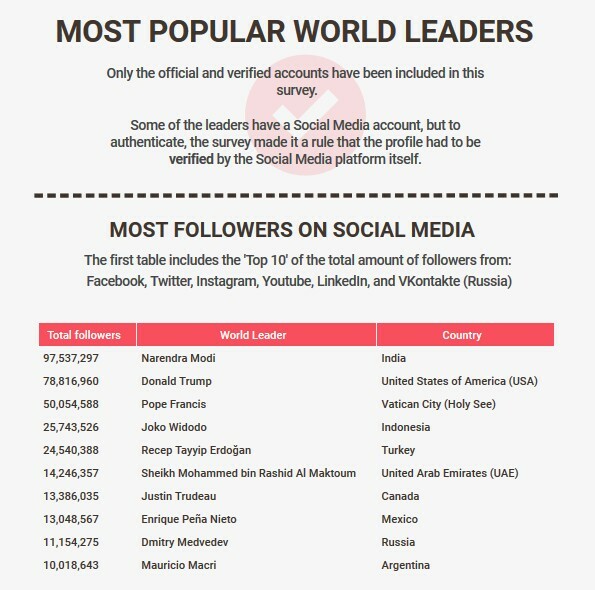 The survey reveals that India’s Prime Minister, Narendra Modi, has over 97 million followers across all of his social media accounts, making him the most popular world leader. PM Modi is followed by US President Donald Trump, who has over 78 million followers, and Pope Francis, who has over 50 million followers. The survey took into account Facebook, Twitter, Instagram, YouTube, LinkedIn, and VKontakte (Russia) pages of the respective world leaders to come to the conclusion. If individual accounts are taken into consideration, PM Modi tops the Facebook list with over 43 million likes, places third on Twitter with over 39 million followers, leads on Instagram with over 11 million followers, takes the top spot on YouTube with over 770k subscribers, and tops the chart on LinkedIn with over 2.4 million followers. In contrast, US President Donald Trump holds the second spot on Facebook with over 23 million likes, tops the Twitter list with over 47 million followers, lands in second on Instagram with over 8 million followers, and doesn’t have an account on YouTube and LinkedIn. Only 8.78% (31 out of 353) of all world leaders are women. The average age of all world leaders is 61.6, with the youngest leader being Austria’s Federal Chancellor at just 31 years old and the oldest being Queen Elizabeth II from the UK who’s 91 years old. The most common title used by a world leader is President, closely followed by Prime Minister. Chancellor, on the other hand, is the least used title. Emmanuel Macron of France and PM Modi are the only leaders with accounts on all platforms. Russian president Vladimir Putin has no presence on social media. The report features data that was last updated on 17th January, 2018, so it’s fairly recent. You can check out the full report from the link below.